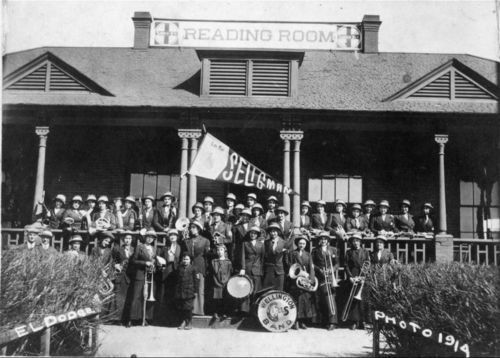 Photo of the Wellington Girl's Band standing in front of the Atchison, Topeka & Santa Fe Reading Room. In 1913 the Welington Girls' Band played at both the Kansas State Fair and the Oklahoma State Fair. The following are the names of members of the band with instrument each played. CORNETS: Irene Osborne, Pauline Osborne, Claudine Waugh, Velma Prock, Vera Wonder, Marie Thompson, Mary Lamb. HORNS: Jennie Phelps, Esther Liddle, Marguerite Smith, Rosie McKowen, Mollie Harbaugh. BARITONES: Maude Price (Mrs. F.E.) Mildred Schwinn, Ruth Droz. TROMBONES: Ruth McIntypre, Ruth Barner, Glays Robinson, Pauline Nelson. BASES: Pearl Loofburrow, Hazel Brumley, Ruth Infield. DRUMS: Ersel Loofburrow, Leah Knowles. CLARINETS: Mildred Waugh, Bessie Whitmann, Laurina Hunt, Grace Burks, Isabel Brandenberg, Vaughnie Waynick, Alice Rutherford, Essie Davis, Sybella Matthews. SAXAPHONES: Marie Murphy, Vesta Kerns, Cecil Pierpont, Olive Collins, Pansy McIntyre, Emily Bailey.